Grand Central Publishing, 9781538730133, 320pp. TWO PEAS & THEIR POD celebrates a family, friends, and community-oriented lifestyle that has huge and growing appeal. Maria the genuine, fun, relaxed mom next door who's got the secret sauce: that special knack for effortlessly creating tantalizing and wholesome (and budget-friendly) meals with ease. From a Loaded Nacho Bar bash for 200 guests to quick-and-easy healthy weeknight dinners like never-fail favorites like One-Skillet Sausage Pasta or Asian Pork Lettuce Wraps (always followed by a fab dessert! ), Maria shares her best lifestyle tips and home cook smarts. 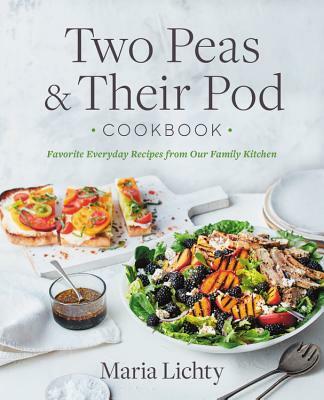 An essential resource for parents looking to update their healthy, inexpensive, time-saving, kid friendly meal roster; aspiring home cooks who want to eat-in delicious food more than they eat out; as well as anyone looking to share their love of food and the giving spirit with their neighbors, TWO PEAS & THEIR POD will help readers bring home that (achievable!) slice of Americana, where families come together to enjoy fresh and nutritious meals and there's always a batch of still-warm cookies waiting on the counter. Maria Lichty's blog Two Peas & Their Pod began after friends and family asked for the recipes she and her husband used to cater their own wedding, and Maria and Josh have been blogging ever since, sharing stories of their culinary and lifestyle adventures. When Maria isn't in the kitchen, she enjoys watching sports (football, baseball, basketball, hockey--you name it! ), hiking, running, traveling, reading, watching movies, and going to the park with her special taste testers, sons Maxwell and Caleb. Maria and her family live in Salt Lake City, Utah.